OMG! It’s been almost a year since our last blog post… The EC artists have been busy, and yes, having fun! We’re upping our game… The EC will now be offering matted prints of artworks by selected EC artists, in addition to individual and boxed sets of note cards. Images, sizes, and prices to come. Trying out new boxes for our sets of note cards. The EC artists will be selling prints and note cards, along with ceramic ornaments– letters and hearts– at the 2015 Holiday Artisan Fair. If you’re looking for a gift, be it for others or for yourself, come to the Merced Multicultural Arts Center at 645 W. Main Street on Friday, Dec 4th, 11am-6pm, and Saturday, Dec 5th, 10am-2:30pm. Makin’ tags for EC artworks. In addition to the goods for sale in our booth, we will have more amazing ceramic creations on exhibit, which are also available for purchase. The EC artists have spent the last few months working in paper clay, and the results are beautiful. In the glass case on the 2nd floor landing– paper clay houses and buildings. In the glass case on the 3rd floor landing– paper clay bowls and vessels. We’ll have more details about EC art on exhibit next week… WE PROMISE! Paper clay bowls by (l-r) Yadira Prado, Arnold Hernandez, and James Brizendine. Rows and rows of letters strung and hung and ready for sale! Here they are: the 2014 Enrichment Center ornament… LETTERS. This year, the EC artists’ ornaments offer a new way to personalize your holiday (or any-day) gift giving and decorating. Our 2014 ornaments go everywhere! On inside trees and outside trees, garland, gifts, and stockings… boxes, bags, hooks and bottles… chains, pins, collars, and key fobs. Personalize your holiday gifts this season, with handmade ceramic letters which can be used year-round. Thanks to all who participated in our Art for the Heart fundraiser for community heart health. We raised $1200 for the Mercy Foundation to use for the Cardiac Rehab Department. The funds will help people with heart disease, who do not have a funding source to pay for their rehabilitation. The exhibit was up at Mercy Medical Center on February 14th, and we’ll be taking it down on Tuesday, March 5th. If you are a Mercy employee, and would like to pick up your heart at the hospital, please let me know by Monday, March 4th. All other hearts will return to the Multicultural Arts Center. However, the back entrance on Arts Alley is open Monday through Friday during all Arts Center hours, including when the galleries are closed. On Saturday, March 9th, the hearts will be available at the front desk in the main gallery on the 1st floor, during business hours– 10am to 2pm. Front and back entrances are available. Hearts must be picked up by Friday, March 15th. Thanks again to everyone who participated, making this a successful fundraiser for community heart health. See you next year! 1830° is too hot to cook James and Shirley’s peanut butter cookies, but it is the perfect temperature for firing our glazed hearts. It takes an entire day of carefully orchestrated adjustments to bring the kiln up to that temperature. By the end, a view through a peephole reveals an orange glow reminiscent of the surface of the sun. It then takes another two days to cool so the pieces inside can be removed. 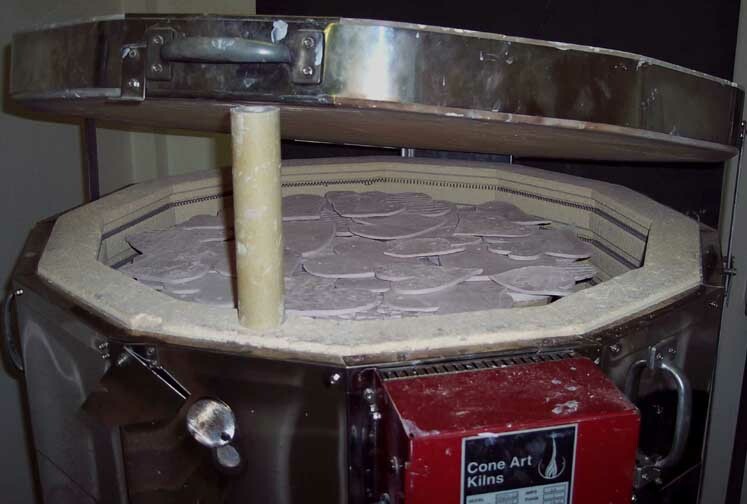 Kristine, our Clay/Ceramic Arts instructor says, “It’s like Christmas!” We practically hover around the kiln, checking to see if the temperature has cooled enough to open the lid by another glorious few inches. If we open it too quickly, the fired glaze, which is like glass fused to the clay, may crack and chip. If we open it too slowly… we may die of anticipation. We know that the pieces will be fantastic, but because the glaze is so chalky looking, the final image is like a secret. 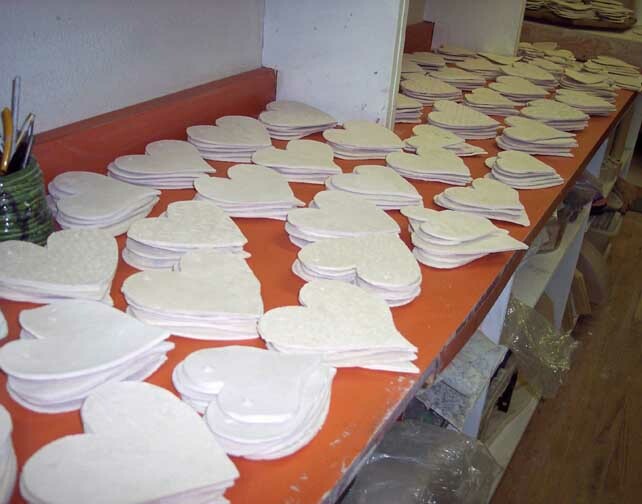 The hearts have gone into the kiln. When it cools, we’ll remove them to see the vibrant color of the formerly chalky glaze, and awesome art of the artists who glazed them. 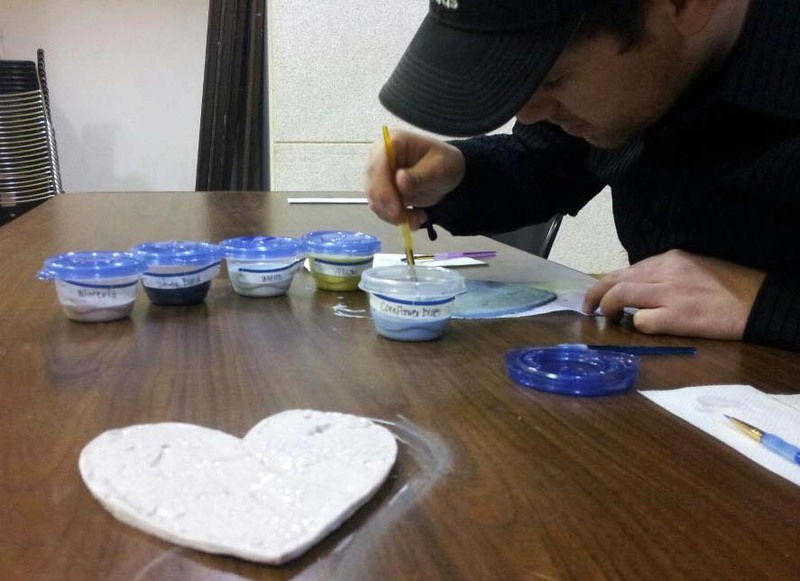 Technically, you’re painting a coating of silica-based fluid (glaze), which, when fired in the kiln, will fuse to the surface of the clay heart… now you know why we just refer to it as glazing. When you spend as many hours as we do surrounded by art, making art, promoting art, talking about art, art becomes such a natural part of your speech and action, that you may forget the large number of people who may perceive art as being slightly foreign– a special skill, unique only to those gifted with a sense of creative genius. Not so!! When you ask people who feel that way to engage in artmaking, many of them may imagine that you are asking them to do something they aren’t qualified to do… like auto repair, networking the office computers, catering a wedding, or teaching high school math. 1. You don’t have to worry about your skills. We will introduce you to the materials, how to use them, and be there to provide assistance and answer questions. 2. We’ve set it up so that it is only as complex as you want it to be. 3. It doesn’t matter how you paint the heart, as long as you paint the heart– whether you spend 2 hours perfecting every detail, or 2 minutes applying slapdash one-color coverage. The funds we collect will be going to the Mercy Foundation to be used in the Cardiac Rehab department, to help people with heart disease who do not have a way to pay for their rehab. You should give yourself about 1 hour to select and glaze your heart. Those who have come in expecting to do it in 30-45 minutes tend to run out of time. The glaze goes on looking very chalky, but firing reveals the vibrant color and glossy texture. Drop-ins are acceptable, but reservations are a good idea. If you drop in, and there is no more space, you may have to wait. We do not have a credit card machine. We accept cash and checks. The cost is a $10 donation per heart. We also have a few small hearts, which were designed to be glazed as a pair for $10, but which may be glazed individually for $5. Fortunately, except in rare circumstances (usually involving a professional artist who is trying to become rich and famous, or doesn’t learn from his/her mistakes), there is no failure in art. It is what it is. Most artists will tell you that mistakes are gifts you give to yourself. Making a mistake, you will either learn a valuable lesson—how not to do something, or you will learn something new—how to do something you didn’t intend to do… but will totally try again. Putting the pieces together is difficult when your partnership doesn’t yet have partners. We knew we wanted to work with Mercy Medical Center, but we didn’t have any contacts there. Our good friends Monika Modest and Melissa Kelly-Ortega came to our rescue, providing awesome contacts. Now we’re collaborating! We wanted to work with American Heart Association, but they no longer have a local chapter. It was important to keep the funds we raise local, so we’re working with our new partner– Mercy Medical Center– to identify a great organization to use our funds– promoting and advocating for healthy hearts, and supporting people making heart-healthy changes. Now, on to the workshops! Pounding, rolling, slabbing. Cutting, smoothing, drying. 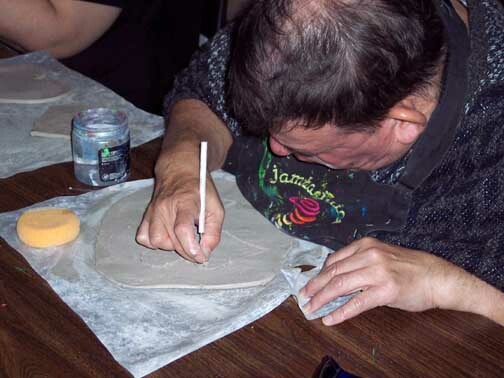 In late November 2012, the artists of the Enrichment Center began preparing clay hearts for a project to promote health and wellness in the New Year. Artist Denise Saelee carefully smoothing clay hearts for the Enrichment Center’s collaborative project Art for the Heart. December 2012. Artist Richard Chavez cutting hearts from clay in preparation for the Enrichment Center’s collaborative project Art for the Heart. December 2012. Sadly, most of us have lost someone we care about to a heart-related illness. The New Year is the natural time for reflection and making changes for a better year. Health and wellness generally top the list of areas where we focus those changes. The artists and staff of the Enrichment Center, like everyone else, recognize the changes we could make to promote our own heart health. We also recognize the therapeutic qualities of the arts, and thought it was about time to make our own collaboration with the local health community. 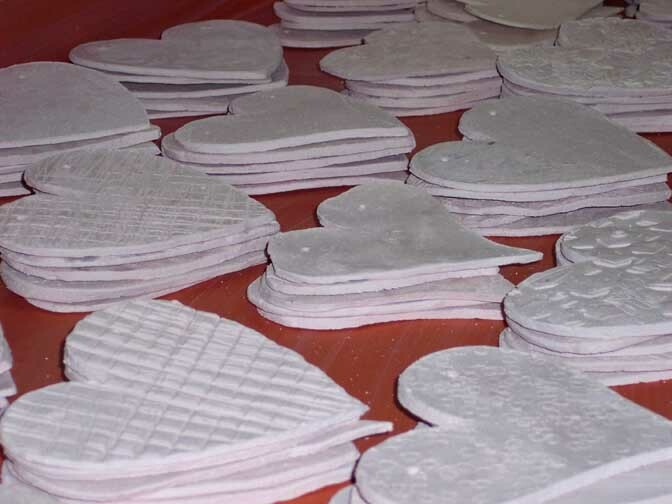 These hearts have been dried and stacked, waiting to be loaded into the kiln for firing to bisque– the stage when clay can be glazed. December 2012. 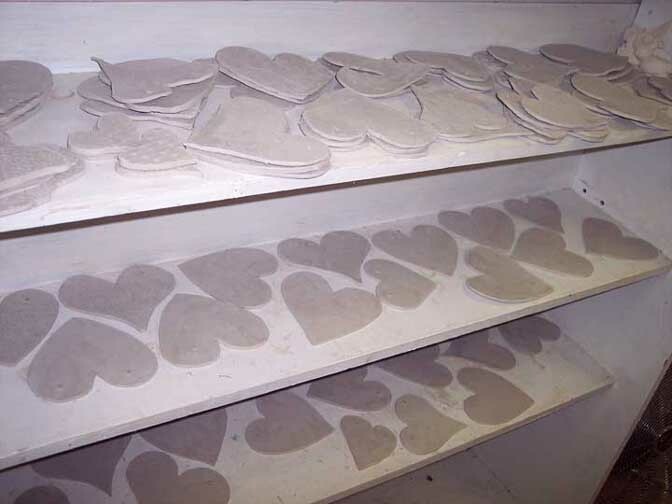 Clay hearts drying on shelves in the EC kiln room. Hearts on the top shelf are dry enough to fire, while hearts on the lower shelves are still too wet. Another week and they’ll all be ready. December 2012. 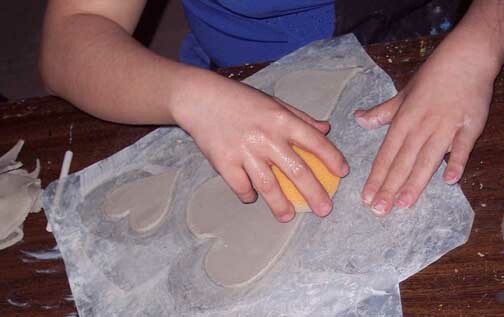 The artists worked throughout December to make hundreds of clay hearts for the Art for the Heart project. 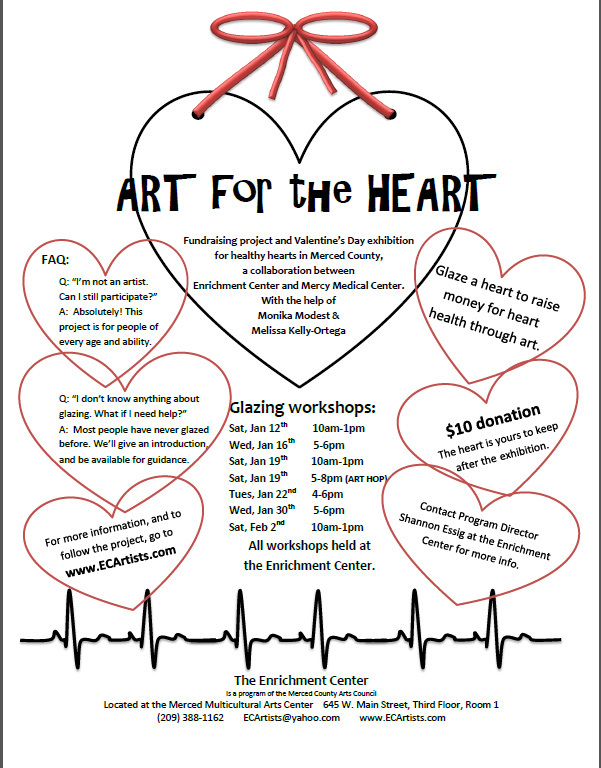 People are invited to glaze a heart for a $10 donation, with proceeds going to a local organization which promotes heart-health, and assists people with making healthy changes. As part of glazing their heart, participants will be encouraged to dedicate their heart to something meaningful– a loved one lost to heart disease, a personal commitment to change unhealthy habits, or some other goal that will improve their health and well-being. 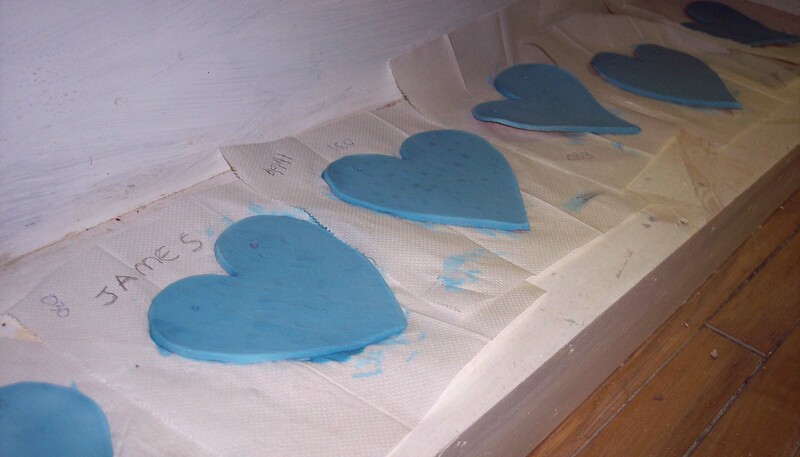 The first batch of clay hearts for the Enrichment Center’s collaborative project Art for the Heart. The kiln was fired the day before. Once we were sure we wouldn’t burn our faces off while opening it, the lid was propped open to allow them to cool. 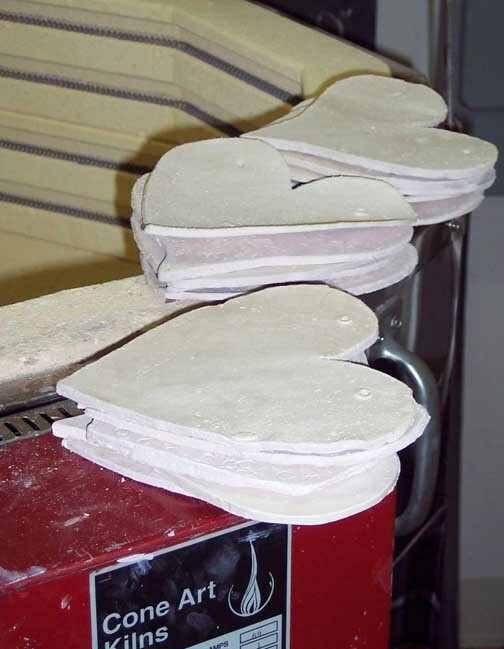 Clay hearts sitting on the edge of the kiln during unpacking. Over 300 hearts, just unpacked from the kiln after firing to bisque. They’re ready for glazing during the Enrichment Center’s collaborative Art for the Heart project. January 2013. 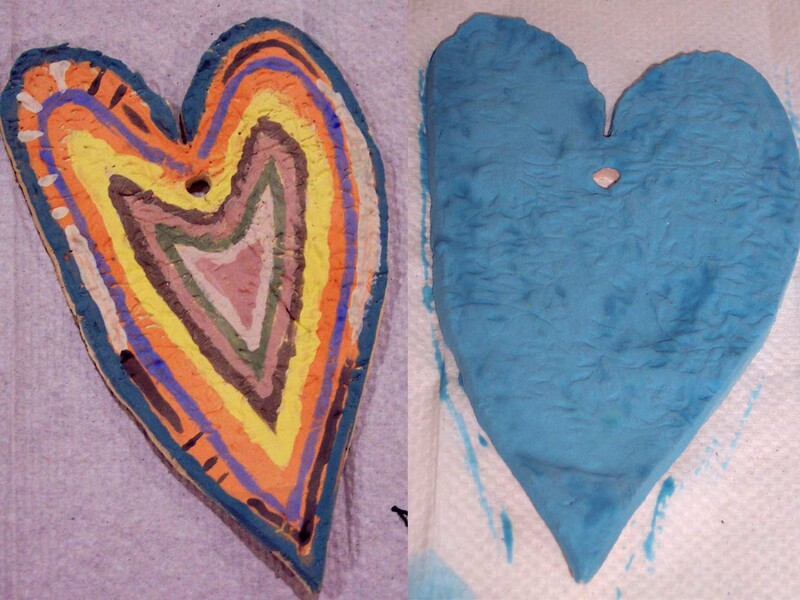 This is just a sample of the clay hearts we’re offering for glazing to raise money for heart-health and a healthy New Year, with our collaborative Art for the Heart project. January 2013. 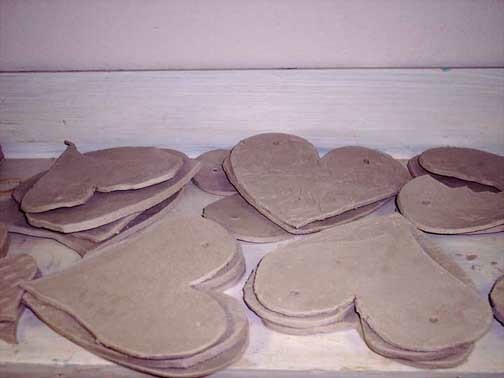 The first batch of over 300 dried clay hearts was fired to bisque in the kiln this week, and are now ready for glazing. Though clients used a general size template, each heart is different. Since we have sooooo many, there should be no lack of choices– a heart for everyone. 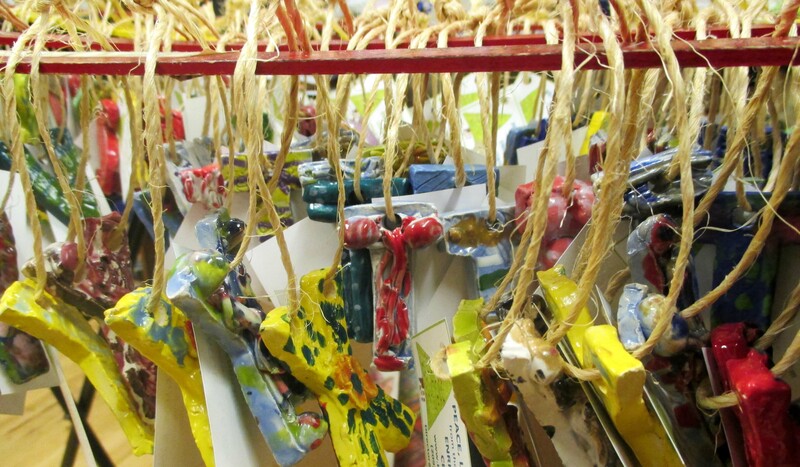 Contact the Enrichment Center for more information, and to sign up for a glazing workshop. Art for the Heart!